PELCO® TEM grid Support Films of Formvar, Formvar/Carbon, Carbon, and Silicon Monoxide are available on the following 3.05mm O.D. grids: 0.4 x 2mm single slot Cu, 75 mesh Cu, 200 mesh Cu,Ni or Au, 200 mesh Hex Mo, 300 mesh Cu, Ni or Au, 300 mesh Hex Mo, and 400 mesh Cu, Ni, Au, Al, Ti and stainless steel. Support films on the finer mesh grids can withstand considerable handling during specimen preparation. Those on slot and 75 mesh grids require more gentle handling and are ideal for those applications requiring large viewing areas without grid bar interference. Our popular line of PELCO NetMesh Grids (our trademarked lacey films) are available on 200, 300 and 400 mesh grids. These robust films allow for viewing of specimens without interference from underlying support film material. The complete PELCO® line of support films meets the requirements of most applications in all fields of electron microscopy. TEM Support Film Product Note, How Material is Layered on the Grid. This Support Film Application Guide will help you determine what support film to use for your particular transmission electron microscopy project. Once you have decided which substrate best suits your needs, you can go back up on the page for a listing of available Support Films and pricing. Film Is Lacey Film suitable for this application? Typically packaged in PELCO® TEM Grid Storage Box (Product Number 160) but is subject to change to other equally suitable grid storage boxes. 1. Formvar: A film of pure Formvar, with no stabilizing coating. These films are useful for your customized coating of stabilizing material or for the support of thin sections. 2. Formvar, Stabilized with Carbon: A Formvar film covered with a "light" layer of carbon. The heat and electrical conducting properties of carbon help to stabilize the Formvar films when exposed to the electron beam. This is a resilient, all-purpose specimen support film, ideal for mounting thin sections and for applications using lower ranges of magnification. The 200M-TH grids (Prod. No. 01803 and 01803-F,01803G and 01803G-F), plus the 300M-TH grids (Prod. No. 01804G and 01804G-F) are thicker and more rigid than normal and useful for many applications - particularly where a lot of grid handling is involved. 3. 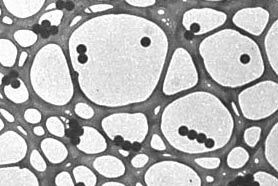 Carbon Type-B: A Formvar film coated with a heavier layer of carbon. This is the strongest and most versatile support film we produce. It is stable in the EM under all operating conditions including high magnification with high beam intensity. The films can withstand vigorous specimen preparation techniques. 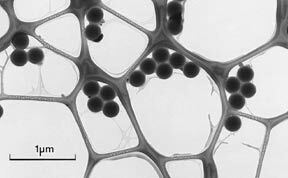 If the carbon surface is hydrophobic, specimen suspensions can be applied to the Formvar surface. 4. Carbon Type-A: Carbon support films with a removable Formvar on the opposite side of the grid. When the Formvar is removed, by dipping in solvent, a pure carbon film remains. (Note: The Ultrathin Carbon Film on a Lacey Carbon Support Film, Prod. No. 01824, has no Formvar backing.) These films are stable under all EM operating conditions and are for use where the presence of a Formvar layer cannot be tolerated. Pure carbon films tend to be more delicate than those with a Formvar backing and require more delicate handling during specimen preparation than most other support films. (a) Carbon Type-A: Carbon support film of 15 to 25nm thickness. (b) Ultrathin Carbon Type-A: Carbon support film of approximately 3nm thickness. (c) Ultrathin Carbon Film on a Lacey Carbon Support Film: Pure carbon support films with no Formvar backing. This new product has an even thinner carbon film which is mounted on a Lacey carbon film. The carbon support layer lying over the holes is less than 3nm in thickness and is the thinnest support film available. It is particularly useful for high resolution microscopy of low contrast particles and is also ideal for use with the Energy Filtering TEM. (a) Formvar Stabilized with Silicon Monoxide: A Formvar film coated with a light layer of silicon monoxide. (b) Silicon Monoxide Type-A: Silicon monoxide with a removable Formvar backing on the opposite side of the grid. When the Formvar is removed, by dipping in solvent, a pure Silicon Monoxide film remains. These films are stable under all EM operating conditions and for use where the presence of Formvar cannot be tolerated. Pure Silicon Monoxide is more delicate than those with Formvar backing and require more careful handling during specimen preparation. A lacey network support film. The holes in the lacey support film vary in size from less than a quarter micron to more than 10 microns making them ideal for any type of specimen. Lacey support films are extremely strong and withstand vigorous specimen preparation treatment. The specimen material is supported by the film network but lies across or protrudes into the holes of the mesh. This allows high definition imaging without the effects of underlying support material. Lacey films can be used for specimens ranging from large crystals and other particulate material to virus particles. Smaller particles, such as viruses or bacteria, tend to adhere around the inner edges of the holes, an ideal situation for high resolution microscopy. Lacey films are also ideal for selected area electron diffraction imaging. We offer four types of lacey film. See the Support Film / Substrate Application Guide at top of page. 0.26µm dia. Latex on a Lacey Support Film, example of application. (a) Lacey Formvar Stabilized with Carbon: A Lacey Formvar film with the lacey structure enforced by a heavy coating of carbon. Holes are completely open. (b) Lacey Carbon Type-A: A Lacey carbon film with a removable Formvar backing on the opposite side of the grid. When the Formvar is removed, by dipping in solvent, the Lacey carbon film remains. These films are stable under all EM operating conditions and for use where the presence of Formvar can not be tolerated. Pure Lacey Carbon is more delicate than those with Formvar backing and require more careful handling during specimen preparation. Holes are completely open. (c) Lacey Formvar Stabilized with Silicon Monoxide: A Lacey formvar film with lacey structure enforced by a silicon monoxide coating. Holes are completely open. (d) Lacey Carbon Films with No Formvar: Holes are completely open.